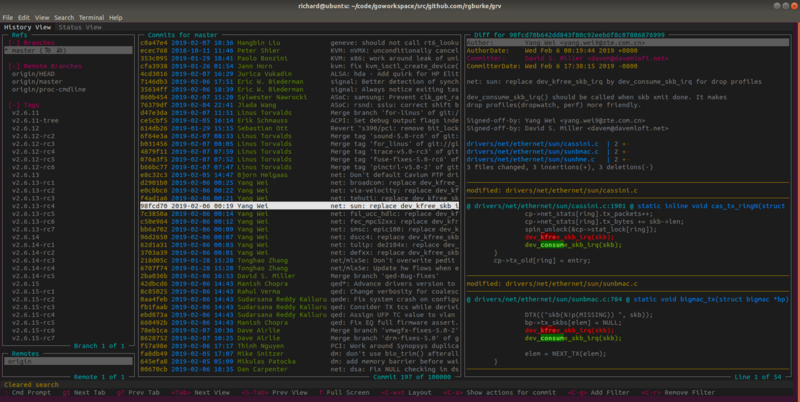 GRV is a terminal based interface for viewing Git repositories. It allows refs, commits and diffs to be viewed, searched and filtered. The behaviour and style can be customised through configuration. A query language can be used to filter refs and commits, see the Documentation section for more information. Note: grv is currently an alias used by oh-my-zsh. Add unalias grv to the end of your .zshrc to invoke GRV. where NewBinaryName is the alternative name to use instead.